Looking for good and cost effective battery operated home security cameras? But with different options out there, you can’t see the wood for the trees? This comprehensive guide today will take you on a tour of all things about battery home security cameras, including why you should choose the battery powered home security cameras, what features to look for, how to select a best one, which is the all-round winner and a ton of other things. The battery powered security cameras for home can be your top choice if the following scenarios also apply to you. No electric power can reach the location where you want to install the cameras or you have real trouble bringing power there, like your chook house or empty home? You don’t like running messy wires around or don’t want the cables and drilling holes to break the decor of your new home? You wish to move or reposition the cameras when your specific need changes? For example, you will need to move the cameras for your new home construction site as the project completes. Do you want to add a camera for your rented house legally without drilling holes or running wires? You want your home to be protected even in case that someone unplugs the line or in event of electrical outages? You are looking for an easy-to-use camera for elderly which requires little efforts for installation and setup? Besides the listed ones, there are far more reasons why you should choose battery operated CCTV home security cameras. And more ideas from you are welcomed – feel free to tell us your incentives to go for battery home security cameras in the comment box and we might include them in this part. Before your purchase, you should know what features of battery operated home security cameras you desire most. Below are the requirements of battery powered security cameras for your apartment, flat, new house, second home or vacation house that you should account for. Almost all battery operated home security cameras in the market now are packed with PIR motion sensors, which work by measuring the changes of infrared energy in the field of view. Some high quality wireless battery powered home security cameras, like Reolink Argus® 2, can also send you multiple alerts (email snapshots, push notifications and siren alarms) when they are activated by the motion detectors. And the 4G/3G battery operated home security camera Reolink Go, also allows you to record your own customized alert message and get notified with it when motion is detected. Since the placement of your battery powered home security camera system can affect how quickly motion is detected and the camera begins recording, it is important that you place the camera in the right place to avoid time lag from motion detection to video recording. With an infrared cut filter and digital noise reduction technology, a battery operated home security camera ensures true and accurate color reproduction without noise. Some top battery powered infrared security cameras for home dwellings, like Reolink Argus® 2 and Reolink Go, even feature starlight image sensors, which can produce better images and videos when lighting conditions drop at night. You may also adjust the camera settings to obtain color images/videos if you want. Below is a color night vision image shared by a user of Reolink Argus® 2. Don’t miss: Read the news of one suspect arrested after she was caught on Reolink security camera stealing packages. Even you’re not at home in the daytime, the battery operated home security cameras can still allow you to tape the crooks, check on your pets, babies or elderly parents on your smart phones. 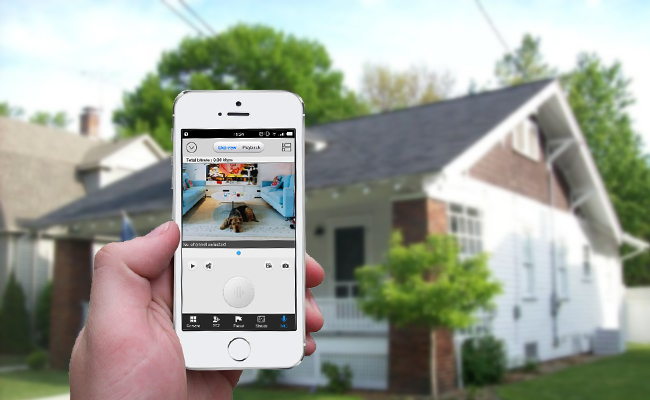 And it is more favorable that the wireless battery home security camera App has an intuitive user interface. Then you can easily tweak the basic settings, such as adjusting the motion sensitivity and scheduling motion recording via the mobile app. The battery operated home CCTV security cameras with memory card are your top options if you don’t want to be bound by the long-term contract or shell out extra money for a base station, or in case your remote second home/vacation house has no network. No matter your home has WiFi/Internet connection or not, the battery powered home security cameras with memory card (slot) can still record motion triggered events onboard for your later check (you can also play back the videos on your phone if network is available). No doubt that the wireless battery powered home security cameras with long battery life can save you much trouble if you only go to your remote home or your elderly parents’ home at intervals. And it is even better if the battery backup home security cameras can send you notifications when the power is running low, so that you can replace or charge the batteries in time before the camera goes dead without your conscious. Reolink Argus® 2, for example, would send instant alerts to your phone when the battery power is reaching 10%. 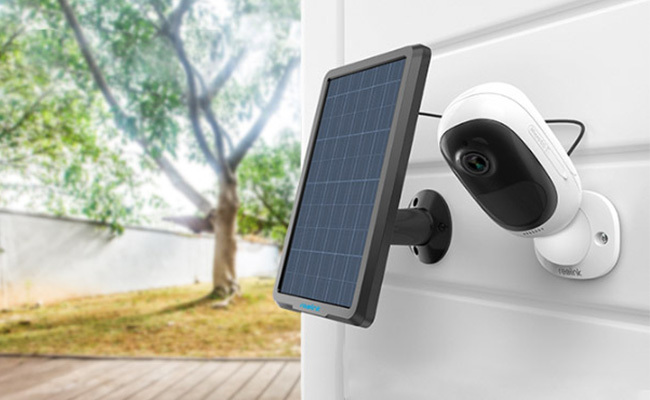 This smart battery operated home security camera can also get continuous power from the included rechargeable battery and Reolink solar panel (requires a separate purchase), which is both environmentally-friendly and money saving. Editor’s Tip: Remember to check whether the battery powered security cameras for homes are equipped with standard batteries, in avoidance of explosions or other safety hazards. Looking for a cost effective battery operated home security camera to monitor your front door, backdoor, garage, yard, garden or the hallways, laundry areas and associated vicinities? When you say cost effective, I know you DON’T mean cheap at the cost of image clarity and performance. But that’s the way some security camera sellers play the trick – compromising the camera quality to offer a lower price. To obtain a battery home security camera that is decent in both price and quality, it is advised to choose the reliable brands that enjoy high reputation from both users and the top media, such as Reolink, who are positively rated by over 200,000 happy customers worldwide. And WATCH OUT – the tag price of some battery control home security cameras may not be the final price you need to pay for a battery powered home security camera system. It may not count in the batteries, customs duties, freight, etc. Also, some battery operated home CCTV security cameras cannot work alone and you have to spend extra money on a base station. So before you place an order, take some time to check these issues. Bump: You may need to allow for different factors based on your specific usage. For example, if you want a battery powered home security camera fully exposed to the elements for your elderly parents’ home, an outdoor battery home security camera may be your right fit (click here to learn how to choose a best one). During the search for top-notch battery operated home security cameras among reputable brands, you may find that even some renowned camera providers deliver DOA products and offer no customer support. So don’t be cheated by what the security company claims, follow the insider tips below to find the best battery home CCTV security cameras. The battery operated home security camera reviews are not only limited to the user comments in the Amazon or official website product page, but also include the professional reviews by the top-tier technology media with score breakdowns, pros and cons, etc, which are far more trust-worthy. Besides, the Youtube video reviews of battery security cameras for home are also a good way to check out the camera performance within minutes. And the videos made by the Youtubers with a large amount of subscribers are usually more reliable. 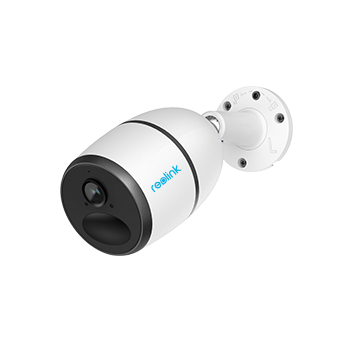 Taking Reolink Argus 2®, a battery operated outdoor home security camera for example, you can refer to the following reviews to decide whether it is a good option or not. Youtube video reviews: Watch the video below to see whether this battery home security camera would be your best bet. 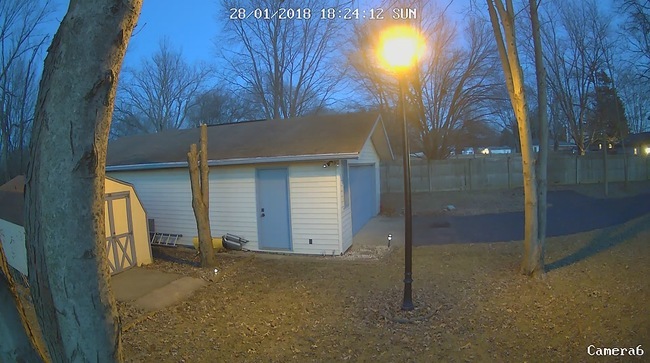 How can you tell if the battery operated home security cameras deliver high quality videos in the daytime and at night? Will they be able to monitor your single family home or tenement even in total darkness? Although the security camera sellers would provide video samples for promotional purpose, the footage recorded by the real users are undoubtedly more trust-worthy. Reolink recently has launched a video-sharing project, which aims to encourage its users to share captured videos with product coupons and free giveaways. So you can watch the footage of the camera you intend to buy to see if it actually performs well. Below is a video sample submitted by the Reolink Argus® 2 user for your reference. The last but also important point you should note is the after-sales service of battery operated home security cameras. In the unfortunate case that your battery powered wireless home security camera system goes wrong, will you receive a response back in a day or two from the technical support of the camera seller? Getting the detailed information will help you learn whether the sellers of battery powered home security cameras own a professional support team and save you much trouble when you need assistance later. After comparing the pros and cons of popular battery operated home security cameras from different brands, here comes the best and affordable option for you: Reolink Argus® 2. Reolink Argus® 2 is one of the few solar powered & battery operated home security cameras. It is superior to other other contenders in starlight night vision and flexible powering options (rechargeable battery powered & solar powered). You can install it indoors & outdoors without worrying that the camera may fail to work due to the dead batteries, as Reolink Argus® 2 can get non-stop power from the included rechargeable battery and Reolink solar panel (requires a separate purchse). 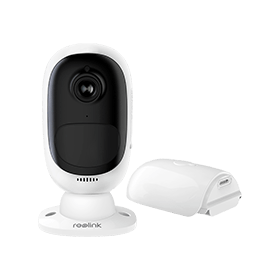 *Reolink has recently launched its first 4G/3G battery powered home security camera, designed to provide an ideal security solution for places without WiFi network and power source. If your remote vacation home or your elderly parents’ home has no WiFi available and you want to monitor the place on your phone, the cellular battery home security camera Reolink Go is definitely your best go-to option. Christmas Deals: Both Reolink Argus® 2 and Reolink Argus® Pro are on big sale for the Christmas holiday promotion (ends on Dec.25 PST). And you can get a 20% discount for these battery wireless outdoor security cameras. Here we have rounded up some frequently asked questions about battery operated home security cameras to resolve your possible puzzles. And if you have any other questions in mind, please don’t hesitate to comment below and we’d like to help. Whether you want to buy battery operated home CCTV security cameras in UK, Canada, Australia, New Zealand or any other countries, purchasing online from the security camera stores or the online shopping platforms such as Amazon, eBay, etc. is the easiest way to go. But you may not enjoy the sound after-sales service, like the due product warranty, if you buy from shopping platforms. So it is more recommended to buy the battery powered home security camera systems from the seller’s official websites. Firstly, it is important to know whether the wireless battery operated home security cameras support rechargeable batteries or not. Also, you need to consult the camera sellers about battery voltage and size that match the battery home security cameras. Taking Reolink Argus® 2 for example, it supports rechargeable lithium batteries, which can be easily purchased from Amazon or eBay. This entry was posted in Buyer's Guide and tagged battery security cameras, home security, smart home, Wire-Free Security Cameras. Where can I buy Roelink Argus battery powered wireless surveillance cameras locally. my zip code is 33330-3419 Southeast Florida. Hi Pete, you can buy Reolink Argus on the official website and Reolink offers free shipping for orders to your place. Here is the direct product link: /product/argus/. Or you can also place an order on Reolink Amazon store: https://www.amazon.com/Reolink-Argus-Wire-Free-Battery-Powered-Wireless/dp/B072BLVWPX/ref=sr_1_1?s=electronics&ie=UTF8&qid=1507510715&sr=1-1&keywords=Argus. can you view the video on a laptop or pc? or only a phone with android? Hi Jerry, you can only view the live videos on your smart phone (iOS & Android) in order to save the battery consumption. For motion triggered events stored in the SD card, you can take out the SD card and watch the videos on your laptop or pc. is there a battery powered camera that you can view your home when away live on a pc or laptop? if not what kind of camera do i need to be able to view my home on a pc or laptop when I am away. Hi Jerry, if you want to view your home remotely on your pc or lap, all the plugged-in wired and wireless security cameras can serve your purpose. So do you prefer wired or wireless security cameras? And what other requirements do you have? Please let me know so that I can help you better. Hi Ted, thank you for reaching out. Do you mean if the camera has time lapse function? Currently Reolink Argus doesn’t possess this feature. If you have any more questions about this product, please feel free to let us know.